Yoga is an ancient health-art developed and perfected over the centuries by the Sages and Wise Men of ancient India. Yoga is not a religion, a metaphysical doctrine, or a philosophy. It is not magic or mysticism, although the amazing improvements it can make in your health, your appearance and your youthfulness may often seem magical, even miraculous. For thousands of years the Yogis of India have used the simple, reasonable principles of Yoga to regain the zest and enthusiasm and good health of their youth, to preserve into middle age the clear-thinking and sound physique of manhood, and to continue enjoying even in old age the resilience, healthfulness, and well-being of their younger years. Yoga can take years off your face and years from your body-and add years to your life. There are certain secret methods by which the Yogis keep the flexibility and “spring” of early youth in their joints and muscles and limbs well into the declining years. It is a common sight to see, in the crowded, colorful streets of Bombay or New Delhi, Yogis well into their seventies and even their eighties, with the straight, graceful posture of a boy, walking with the elastic, springy step of youth… with firm, healthy bodies, their hair dark and glossy and un-streaked with grey. Firm, unlined faces .. . clear, un-dimmed eyes. Not only does Yoga make you look and feel years younger, years healthier, but it lends your body superb healthiness. This system of Yoga does not demand difficult positions and postures, uncomfortable exercises or strenuous diets. 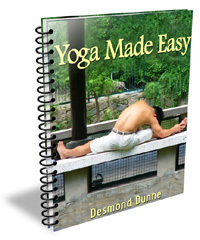 This is where it differs from every other book on Yoga previously published. It describes the simple, easy, “common-sense” secrets of using the natural health God gave you. It works like magic because it enables the body to realize its full potential of good health.